Why Time Off is Important. Entrepreneurs don't know how to relax. 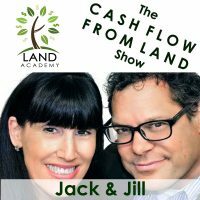 Jack Butala: Welcome to the Jack and Jill show, entertaining real estate investment advice. I’m Jack Butala. Jill DeWit: And I’m Jill DeWit broadcasting. We are back down here in sunny southern California. Jill DeWit: Do we really have to explain this? Jill DeWit: I don’t think that’s true. Jack Butala: … and rightfully so push us to slow down and take time off. Jack Butala: And I appreciate it, and it’s needed. And I honestly can’t wait to hear what you’re gonna say. Jill DeWit: Well, it is needed, and so I like this, and I do have a lot to say about this. Jack Butala: Before we get into it, though, let’s take a question posted by one of our members of the jackjill.com online community. It’s free. Jack Butala: So, it’s seasonal, I think. You know. Jill DeWit: Right. Might flood or something. Jack Butala: It swells, yeah. Jack Butala: Cool, Chuck. What’s the number one attribute that makes property swell in price, skyrocket in price? Proximity to water. So, I understand that this person might be new, and I actually know for a fact they’re not in our group, which is good. If the prices are right, I would run to the bank and close this deal. Jill DeWit: What do you do with the four acres you can’t use? 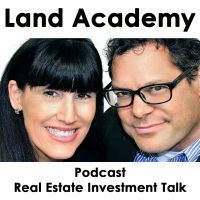 Jack Butala: You know how we all buy property on the side of the mountain and sell it to a mountain climber? Jack Butala: People love boats. Let ’em swell. Jill DeWit: Hopefully it’s a mound in the middle or something. Jack Butala: Maybe people will want a floating house. Jack Butala: Like in “When Harry Met Sally”. Jill DeWit: Reminds me of that Oregon one that I had one just like this. Jill DeWit: Texas and a creek is good. Jill DeWit: Oh my gosh. That’s the best. Jack Butala: I would bet you a dollar that that property will be sold in a week. Jill DeWit: Do you know what just happened? You’ve just sounded like me. Jill DeWit: You just gave it a positive spin. Jack Butala: I don’t think this is bad. Jill DeWit: I think that’s hilarious. You know, the way you just said that is how I would’ve worded that, and I was shocked to hear that come out of your mouth. That is awesome. Jack Butala: Who can tell their friends that they just caught a fish on their own land? Jill DeWit: Very proud of you, Jack. Jill DeWit: Sitting at the kitchen table. I leaned out the window and caught a fish. Jack Butala: It’s a perfect thing. Maybe it’s a houseboat property. Jill DeWit: Because it’s springtime and it’s raining. Jack Butala: Maybe it’s ready to be … This guy just described what a marina is. On the ocean, a marina is like this at night. Jack Butala: A lot of marinas you can only get out of them at a certain time because of the tides and stuff. This is an attribute not a problem. Jill DeWit: This is really not a problem. You know, you’re right, because let’s be honest. There’s tons of creek property like this in Texas. This is the normal, and you build up on the top of the mound, and it goes way down, and where the boathouse is … Oh, and by the way–hello everybody–they make boathouses and things that come up and down with the water level. We’re prepared for this, so we just need to plan for it. I agree with you Jack. Thank you. Jack Butala: I’m a little jealous because I love boats and water and all that. Jack Butala: The same old story of the property who is in a hundred year flood plain that floods every 10 years. It’s a long joke. It’s a real estate joke. Jill DeWit: Oh. Thank you Jack. I appreciate that. Jack Butala: Why is it so important to Jill to take time off? This is the meat of the show. Jill DeWit: Why is it so hard? You know what? I’m gonna turn this around first, Jack, and ask you why is it so hard for you to not take time off? Jack Butala: The honest answer, truthfully, is I don’t know. Jack Butala: That’s the truth. Yep. Jill DeWit: Do you think that it’s just a learned habit that you just don’t know how to relax? You know how to relax, right? Jack Butala: Yeah, I can relax. I don’t know. Taking two weeks off, let’s say, to go to Europe is maybe my nightmare. Jack Butala: And I’ve been all over the world. I like to travel and stuff. Once I’m there, it’s okay. There’s just a lot of stuff to do. You know what? I love what I do for a living. I love where we live. I love the whole life that we have, and I know you do too. Jill DeWit: Have you always been this way then? Jill DeWit: Okay, let me ask you this. Did summer break away from school kill you that you were studying and working on school when you’re on summer break? Jack Butala: I never took a break. I always took classes. In college, I took classes in summer. Jill DeWit: Did you do it because you had to? Jack, I’m sorry. Were you not able to keep up? Jack Butala: I wasn’t taking Calculus twice. No thank you. Jill DeWit: Well, young man, you’re gonna be doing this through the summer too, aren’t you. Jack Butala: Here’s a true story in the actual life of Jack and Jill. I’m gonna throw one of the kids under the bus. I was never like that. And Jill said, “Well, I have to. I’ve been to several colleges.” In front of everybody here, what is that all about? Jill DeWit: You know what? I think we all as children or young adults, we have this stuff we just have to get out of our system. Right? Jack Butala: Like a Catholic girl? Jack Butala: The whole Catholic girl syndrome. Jack Butala: Locked in their rooms their whole childhood. They get turned loose and go nuts. Jill DeWit: I never was, but I was that boring … I was not geeky but kinda geeky, boring … not boring. You know what I mean. I really worked hard in high school. I didn’t really learn to ditch until my senior year. I saved it all up. I graduated with honors and did the whole … All right. Now, after high school? Game on. So, that’s when I went a little bit crazy and started having fun and ditching classes and all that good stuff. I think that we all have to get this out of our system. Some do it earlier, some do it later. Some might do it in their 30’s. Some might wait until their married. Some might do it right after they’re divorced. I don’t know. I depends on your situation, but I think we gotta get something out. Thank you. Jack Butala: As a young man, I was definitely afraid of not being a provider long before I was ever interested in even having a relationship. I just wanted to be like …. make a bunch of dough and have a good career. And then the rest of your life is easy. At our age now, screwing off is one of my favorite things to do. Jill DeWit: Yeah, and you’re good at it. Jack Butala: I know. I don’t need to do it in Europe. I can do it right around the corner. Jack Butala: And I don’t need to do it for two weeks straight in Paris or something like that. Jill DeWit: Okay, well let me run this by you, because I wanna talk about why–I made a couple notes here–and why it think this is important. And as I say this, Jack, you’re in a different situation. Some people … You’ll know why. Number one. The number one reason I think people need to take time off is, holy cow, if they don’t they’re gonna snap. Jack Butala: That’s true, actually. That’s true of anyone including us. Jill DeWit: Thank you. If you are burning the candle on both ends … We all know people that do this, especially here in LA. It breaks my heart. There are people that get up every day, they get up at 5:00, the leave the house at 6:00 with a kid in the backseat, and they’ve gotta drive an hour or two. Some will do two hours, and they do it with the kid to take him to a child care right by the office. Now, they’re there at 8:00, they drop off the kid, and they go work all day. Then they get out of work, they pick up the kid, and they put him in the back in the back of the car seat, and they’re together commuting all the way home. Now, we’re not home until 7:00, and then they throw food in, and they go to bed and do it all over again. Those people need a break. First of all, I have to question some of their choices. That’s not this show. But the reality is there’s a lot of people that are doing that. They live for their weekends, and they live for their vacations, and that’s their time to catch their breath and get to know their spouse again. Jack Butala: All the people I’ve ever met who live for those vacations once or twice a year or the weekend or whatever, their parents did the same thing, so they’re used to it. And they’re not questioning it. They long stopped questioning anything. Oh, that’s the weekend we get a three day weekend off because of the fourth of July. That–Jill, I gotta be real straight with you–is a pile of malarkey for me. Jill DeWit: I don’t think that that’s why. Jack Butala: I think that now you’ve turned your life over to the man. Jill DeWit: No, I agree with you, but I don’t think that it’s a learned behavior. Jill DeWit: I think their friends are doing it. Jack Butala: Yeah, that’s what I’m saying. Jack Butala: How, possibly, can you get ahead by taking time off? Jill DeWit: Because you’re putting in the time … No, no, no, no, no. Oh, by taking time off. How can you get ahead by taking time off? Jill DeWit: No, no, no. I mean … No. I’m saying the opposite. I’m agreeing with you. Jill DeWit: That putting in the time at work, they’re not taking time off. You know what I mean? Jack Butala: Yeah. Back in the day if I had a minute off, I was working on something on the side to try to get out of the job that I had. That’s all I was doing. Jill DeWit: That makes sense. That’s a better use of it. And I like that. Jack Butala: I remember I went to Paris one time a long time ago, and all I could think about the whole time I was there was this is a beautiful city and I love spending time here, but it’d be so much better if I’d had something to do here other than be a tourist, like if I had some meetings set up, or if we went looking at real estate, or checking in with whatever, or if there’s some type of job business. New York’s the same way. New York as a tourist is just, in my opinion, no fun. But if you’ve got stuff lined up there and you need to talk to people, it’s a lot of fun. Jill DeWit: Yeah, that’s true. I’ve done that. You don’t feel like you’re goofing off so much. Jack Butala: Time off is super important, but I think time off is really different for a lot of people. I know for a fact two weeks off for you is a blast. Jill DeWit: Mm-hmm (affirmative). You’re right. You’re in different ways making my points. You gotta do it so you don’t snap, number one. Number two, clear your head. Maybe that’s part of what you’re saying, too. Getting away, taking time off, not thinking about your day to day routine, right? Say you are starting a side business or something. It’s hard to do it sitting at your desk all day long with the phone ringing and all that stuff, but if you have a couple days off you can kinda clear your head and not think about your day job, now I can think about my side gig and hat I wanna do and clear my head for that. Jack Butala: Isn’t that what Saturday and Sunday’s for? Jill DeWit: Yeah, but sometimes there’s times you just need more. Come on. Seriously. By taking time off, you can be ready … Here’s another benefit. Say you love your job. Let me even come back to this. It’s us. I love my job. I love that I am doing. Everything is fantastic. I’ve no complaints. But you know what? Sometimes I’m so caught up in my day to day minutiae, I’m not seeing some other things, so if I get myself out of my normal workspace, out of my normal routine, I’m clearing my head, I might think of some fresh new ideas. Huh. I might have a new way of looking at something. Huh. I might solve the problem. There’s been something I’ve been trying to solve in my business that just wasn’t coming to me, and now I’m in a different environment and I see something else that triggers something, I might have a fresh idea. Jack Butala: I totally respect that. I call those research days, and I don’t need to even leave my office for that. Jack Butala: Absolutely. That’s how I recharge my stuff. Jill DeWit: It’s person specific. There’s nothing wrong with that. Jack Butala: When you and I got to dinner, that’s time off for me too. You know what I’m talking about where we’re just done for the day and we meet somewhere and we just go have a lot of fun for a couple hours. Jack Butala: That’s some of the most fun I’ve ever had in my life. Jill DeWit: … 10 days in a row? Jack Butala: … more than we all think. Jill DeWit: I know. Well, we don’t want that. This is the thing, why time off is important. Don’t want that. You know? And what if I took time off? Huh. Here’s an example. How many trips do you and I take, like every single one, that we … Let me back up. Give me one example of one trip that you and I have taken that we have not come back with a new business idea or found a new area of property to market or something new. Jack Butala: That is exactly my point, and there’s none. There’s no example. Jack Butala: Because it’s just in our blood, and that’s what it is. That’s my whole point. We could go down to Long Beach and have a weekend there, and it’s still the same thing’s gonna happen. Or we can go to Tokyo. Jack Butala: I know you are. Jill DeWit: Long Beach? Tokyo? Hmm, let me think. Jack Butala: I think what we’re saying here is that time off is really important, and everybody’s a little bit different about it. Jill DeWit: Mm-hmm (affirmative). I get it. And you should do it. Jack Butala: And you should do it. I agree. Jill DeWit: Even if you have to make yourself. Jack Butala: I take time off every single day. Maybe that’s the difference. Jill DeWit: You know what’s funny? You know what? You just touched on something. That’s interesting. I know that about you because I come into your office sometimes and you’re not working on whatever, but you’re still working and mentally … you know what I mean. You’re taking a little break. My break, I have to push through it. That’s my push through. I push through my work so I can really go relax and have fun. I don’t wanna have a chunk of creative time in the middle of the day. I wanna have it at the end of the day when I don’t have to think about anything else. I don’t have to come back, you know, to work, if you will. Jack Butala: We do both of those. Jill DeWit: Interesting. So, maybe that’s why, too, sometimes I’m a save it up person. I’m gonna kill it this week and save it up. Jack Butala: … that’s just a fall into bed at night with your clothes on position. Jill DeWit: I remember having jobs where that was all day long, and I would come home and I would just say, “Please, no one talk to me. I’m all talked out.” Me. Can you imagine me? Jack Butala: No, I can’t. Jack Butala: I would rather work in a factory all day over working in a mall. Even for half. Jill DeWit: Yeah. I don’t know. Jack Butala: I would. Hands down. Jack Butala: Join us tomorrow where we discuss working with your life partner. Jill DeWit: That ties into why time off is important. And we answer your question, should you have one. Post it on the jackjill.com online community. Jill DeWit: I learned a few things there. You know? It’s interesting. Jack Butala: What’d you learn? This is the first time we’ve done our show in a while where we’re learning new stuff about it or about each other. Jill DeWit: Yeah, I had a little revelation. I’m like, oh, that’s why you take little breaks mid-day. That’s your way of doing it. Me, I save it up. It’s funny, because I look at you like, “Come on, why aren’t you working?” And then for me, you’re like, “Why are you goofing off so long?” I’m like, “Dude, because I killed it over here.” I just did it differently. Jack Butala: That’s all. That’s why we live by a marina so we can take the boat out whenever we want, which I do frequently. That’s time off right there. I don’t take it for five hours, I take it for a half hour. Jill DeWit: See, that’s the thing. That’s what you do. I’d rather work, work, work and take it for five hours. That’s the difference. That’s what I learned. Very interesting. If you enjoyed that, please share the fun by subscribing on iTunes or wherever you’re listening. And while you’re at it, please rate us there.